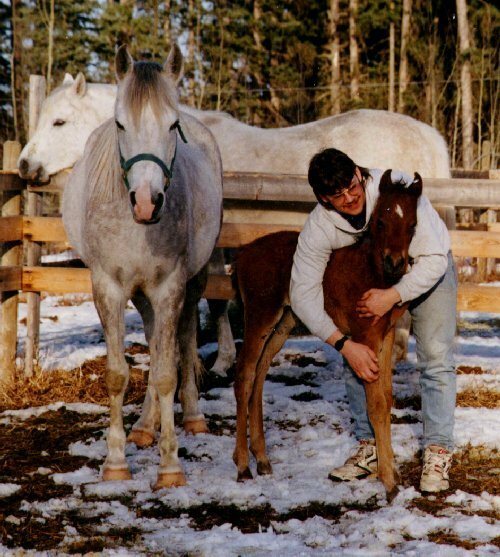 This is a special tribute to a wonderful mare we lost in September 1997. 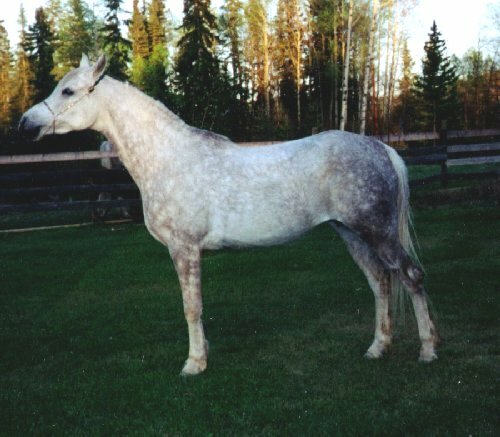 TC Bariefa was an excellent hunting horse, broodmare and friend. Bariefa was one of those mares that wouldn't move if she was in wire. She would stand and wait for someone to remove her leg if she put it over our straight wire - I think she did it for attention! She also likes to play with the straight wire. She would grab it in her mouth, pull the wire towards her and let go. The wire would twang back into place and she would do it all over again. My sister moved her horse Tre-Badi's Image to a farm near the university where she attended. For company, Bariefa went out to the same farm. She was hauled on Sunday afternoon and Monday morning we received a phone call saying she died. She had laid down beside the page wire fence, rolled, got her hooves into the squares in the fence and laid there. By the time she was found it was too late. We know she didn't struggle, the tall grass around her legs was still standing up and she didn't have a mark on her - we figured she was waiting for someone to take her out of the fence. Because we know this makes it harder because she waited for someone to help her and no one helped. She died because her head was lower than her heart and she had a brain hemorrhage. A freak accident. I miss her dearly. I miss the look she would give us with her "alien eyes" while she impatiently waited for her extruded feed. How she loved to have her tail scratched and scares some people by turning around and backing up to them. Or how she's willing do anything you'd ask her. Or the hugs she would give. I think of her all the time and I'm sure Bernie does too. We are both glad we had the privilege of owning her.